Don’t wait until water is unexpectedly in your home by way of a leaky roof. Start protecting your home by using some basic observation. Roof damage can be minimized through regular interior and exterior inspections to detect any minor problems. If you find problems, it could mean that it’s time to replace your roof. Homeowners should complete a roof inspection at least two times a year — spring and fall. The best place to begin is inside your house in the attic. Using a flashlight, look for places where the roof deck is sagging. Check for any signs of water damage or leaks, dark spots or trails, and any outside light showing through the roof. When inspecting the exterior roof, pay attention to any damaged flashing, missing shingles, curling, blistering, buckling, and rotting. 1. 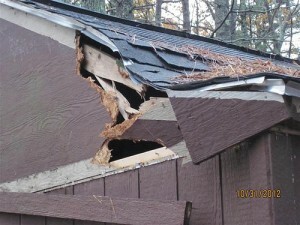 Wind Damage – Over time wind can loosen the nails in roofing material resulting in roof damage. Strong winds and flying debris can also cause significant damage to a roof, often removing some of the roofing material. The best way to avoid this potential damage is to check the roofing and the insulation on a regular basis to ensure it is securely attached to the roof deck. 2. Hailstorms & Snow – Most roofing material can be damaged over time by exposure to various weather conditions. If you live in an area with heavy snow accumulation, you need to ensure the roof is adequately supported against the weight of the snow and properly sloped so the snow will not stay on the roof any longer than necessary. If you live in an area prone to hailstorms, you should be aware that hail can cause serious roof damage, and it is recommended that you carefully inspect your roof after every hailstorm. The Chuba Company is an affordable, local roofing contractor that offers a free no-obligation estimate for storm damage. We also offer a variety of roof finance options to help meet our customer’s needs. The same crew has been employed by us for the past 6 years and has completed over 600 roofs. They have the experience needed to build you a quality roof. Their experience and customer service is also backed by our A+ rating with the BBB and our title as a GAF Master Elite Contractor. When it is necessary to replace a roof, our experienced team will work hard to find the right roofing solution for your home. Give The Chuba Company a call today to schedule a roofing replacement estimate. Follow us on Facebook, Pinterest, and Houzz to see our quality project examples!